Hooray! for Robin Lim . . .and for all of us who voted for her. 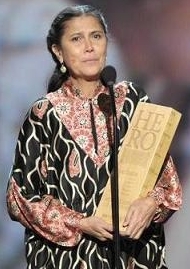 ROBIN JUST WON the CNN Hero of the Year award -- $250,000 and all the rest that recognition like this means to Bumi Sehat. Receiving the honor at a glitzy CNN event, Robin said, "Every baby's first breath on Earth could be one of peace and love. Every mother should be healthy and strong. Every birth could be safe and loving. But our world is not there yet. "Overflowing with Gratitude for ALL of YOU who rocked the World with Oxytocin and Occupied Birth tonight by Voting for Mother-to-Midwifery care, YOU are the Heroes! Thank You for allowing me to stand up for your Vision on CNN. We share a dream of Gentle Birth for Peace on Earth. My heart is filled with love for her and everyone at Bumi Sehat. This award means so much to so many. 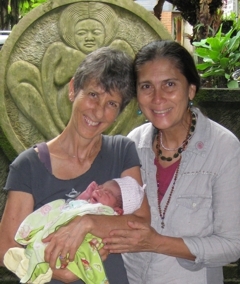 Some of the money will be used to build a new clinic in Bali to continue the work of safe births for happy babies and mothers. My Thank You to each and every one of you who voted. this world is worth preserving." "Every baby's first breath on Earth could be one of peace and love. Every mother should be healthy and strong. Every birth could be safe and loving. But our world is not there yet. If you'd like to make a donation to Robin or any of the other very deserving heros Google has announced they are waiving all fees through the end of the year. It's one click easy to donate: google.com (Robin's charity name is Yayasan Bumi Sehat).